A source defines a set of configuration parameters for one or more file shares or file share sections. 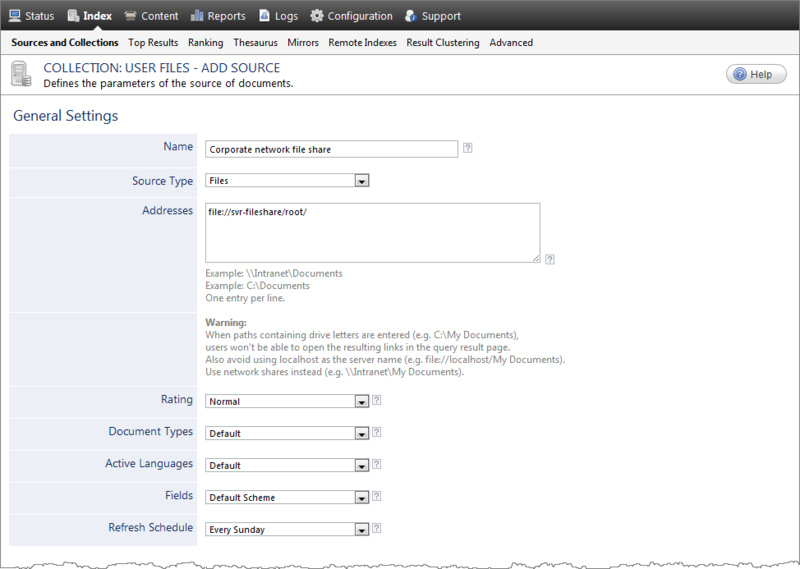 Note: Create two or more sources when file shares or file share sections need different parameters sets. A source uses one or more starting addresses to determine locations to crawl and index. Select the connector used by this source. In this case, select Files. The list of starting address URIs indicating locations to index, one entry per line. You can specify the URIs as local or network paths. Addresses can represent a file system folder or file, a mail archive, or even a folder within a mail archive. Important: When you use paths containing drive letters as starting addresses (ex. : C:\fileshare), users will not be able to open the resulting links in the search result page. A better practice is therefore to rather index network file shares (ex. : \\Intranet\fileshare). Note: For Windows Server 2008, an access denied folder and the files it contains are not indexed. For Windows Server 2003, when a folder was set in the file system to deny access to the crawling account, the folder name was indexed, but not the files it contained. Example: If this source was for a legacy system, you may want to set this parameter to Low, so that in the search interface, results from this source appear later in the list compared to those from other sources. When you decide to use a mail archive mapping file, enter the absolute full path pointing to your mapping file (see Mail Archive Indexing with the File Connector and Creating a Mail Archive Mapping File). Select to index the content of mail archives (.pst). The default is false. Determines the number of file system changes that the connector live monitoring can process simultaneously. The default and recommended value is 1. Number of retries to perform when indexing fails for a file that is opened by another application. The default and recommended value is 2. Determines the number of files that the connector can refresh simultaneously. The default and recommended value is 2. By default this option is not selected so that the crawler applies inclusion and exclusion filters on files but also on folders before crawling so that it only expands folders that you want to index. In rare cases where an inclusion or exclusion filter should only be applied to files (ex. *.tif), you need to select this option so that the crawler fully expands folders to see all files and effectively applies the filters. Note: Selecting this option can have a significant performance cost. The best practice is to use inclusion or exclusion filters to specify folders, not file types. Rather use document type sets to specify the file types to be indexed (see What Are Document Type Sets?). By default this option is cleared. Select this option to index both the share and NTFS permissions (see the Microsoft document Share and NTFS Permissions on a File Server). Click Add Parameter when you want to show advanced hidden source parameters (see Modifying Hidden File Connector Source Parameters). Note: You can control more precisely specific folders or files to crawl using inclusion or exclusion filters (see Adding or Modifying Source Filters). When the source includes mail archives files, you must select this option to ensure users can view the content of mail archives items. Note: When you index mail archive files, a custom document type set handles how mail archive items are opened from the search interfaces (see Setting up a Document Type for Mail Archive Indexing). In the Authentication drop-down list, when you chose to use a specific account to crawl the file system (see Setting up a File System Crawling Account), select the user identity that you created for this account. 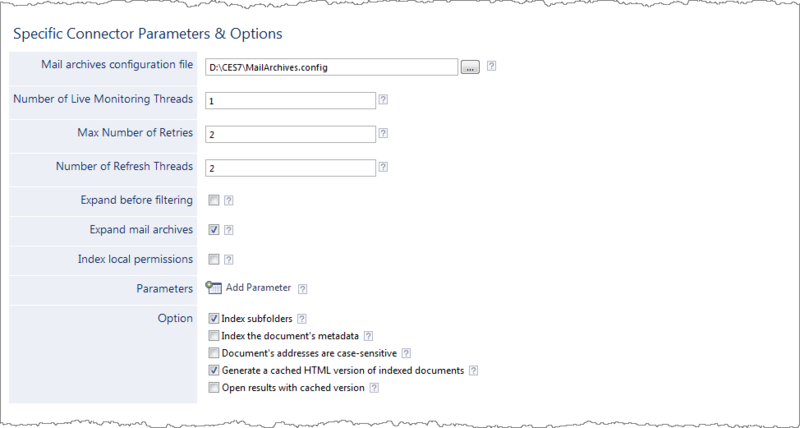 Leave this parameter empty when you want the connector to crawl the file system using the CES service identity (see About the CES Service Logon Account).